with the very able assistance of Irwin Chusid, Jim Price, Chris Bolger, Ellen Miller, TKF, Card Charts, Karen Griffin, The Rayvens, Frank Balesteri, Frank Grasso, The Rake and Rooster. Not for WFMU. 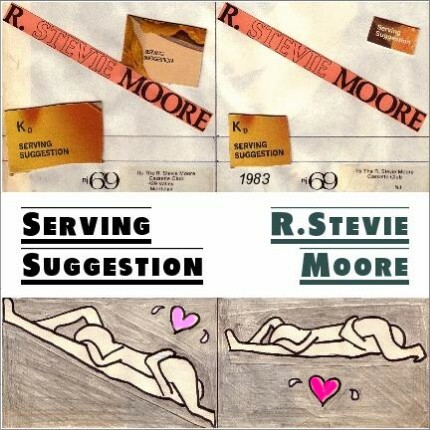 AMG REVIEW: 1983's two-disc Serving Suggestion is a sprawling and largely experimental set of songs in a variety of styles that would seem bewildering from anyone other than the perpetually eclectic R. Stevie Moore. The set kicks off with the nine-minute rap (with a slick orchestral disco arrangement) "Who Is Rick Derringer?," a sarcastic response to a less than enthusiastic reaction by Mr. "Rock and Roll Hootchie Koo" to one of Moore's tapes, and leaps directly from that into the ultra-lo-fi acoustic wistfulness of "Drew University" (presaging the one-guitar-and-a-boombox aesthetic that artists like the Mountain Goats would run with a decade later), which itself fades into a pretty psych-pop trifle called "Yours" and then into a manic bit of Material-like drum-heavy jazz-rock-noise called "Set A Dollar Bill On Fire." That every-song-an-adventure aesthetic continues throughout the entire set, with highlights including "91.1," a gleefully silly parody of Keith's sunshine pop hit "98.6" written in tribute to WFMU, the non-profit radio station Moore worked at through the '80s, and the skeletal art-punk weirdness of "The Jazz Hounds (Eat the Fox)." On the other hand, the 17-minute "Rake," a freeform radio freakout starring Moore and several of his WFMU buddies, makes interesting hearing once or twice, but it otherwise interrupts the flow of an enjoyably strange disc.